But even that 1.5% understates the extent of the pain for most of the workforce. I divide the economy into two parts. 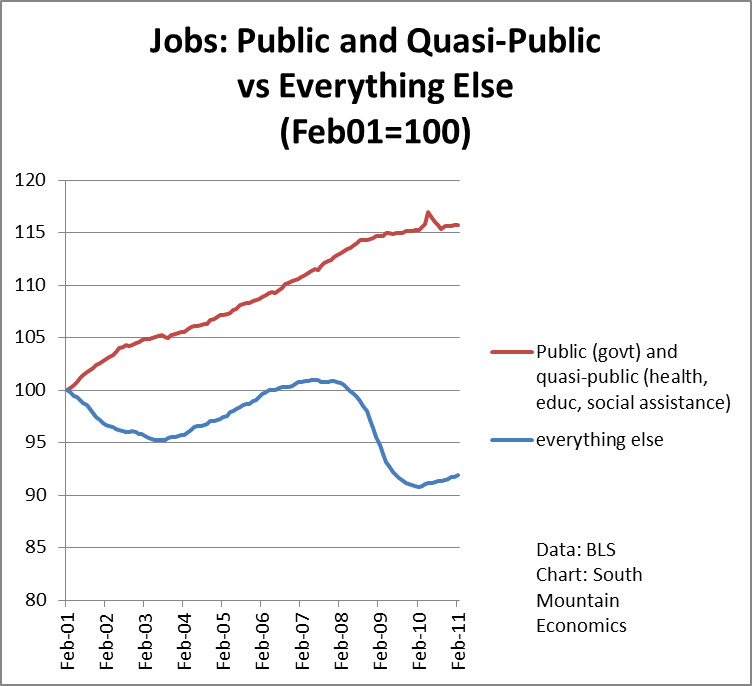 On the one side are the combined public and quasi-public sectors, and on the other side is the rest of the economy. Public, of course, refers to government employees. ‘Quasi-public’, a term I just invented, includes the nominal private-sector education, healthcare, and social assistance industries. I call them ‘quasi-public’ because these industries depend very heavily on government funding. For example, social assistance includes ‘child and youth services’ and ‘services for the elderly and disabled’, which are often provided under government contract. Now let’s look by state. I put the chart beneath the fold, because it’s long and weird and I’m not sure if it going to come out right. Here it is. 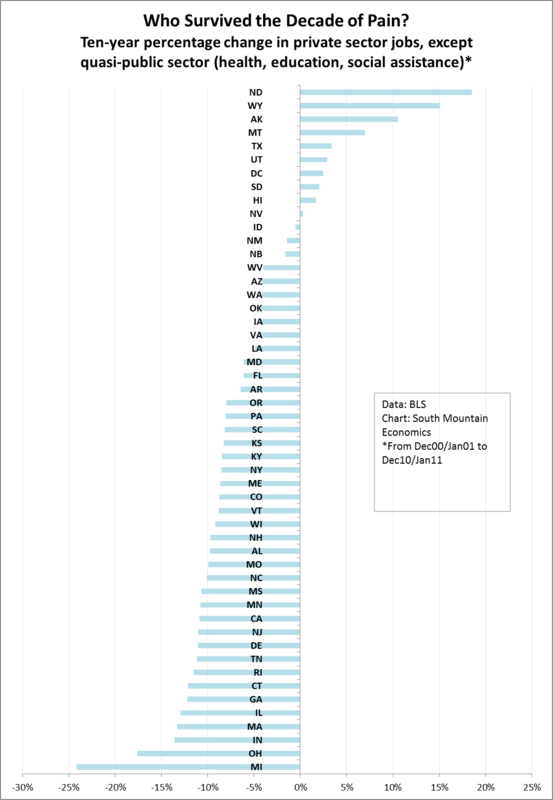 This chart reports on the percentage change of private employment by state over the past ten years, leaving out the quasi-public sector. The worst hit states, not surprisingly, are Michigan, Ohio, and Indiana. Massachusetts has a big decline as well, though I’m not sure that it’s fair to remove healthcare and education, which have always been primary drivers of the MA economy. Then we have some surprises, including CT and NJ. NY, At the other end, some of the natural resource states show job gains over the decade, as did DC, even after removing govt jobs. Those public and quasi-public sector jobs are next, they will be hit hard in the next decade or two. The perfect paradigm for me is the US post office. Their employment peaked at almost 800k in 1999 and is down almost 25% since, that’s what will happen to education and medicine soon. What’s killing the USPS? The twin forces of private competition and technology, ie Fedex and email, the same reasons why those other quasi-public sectors will be demolished. It was just easier to get email going than to set up online learning, so that was done first but those other sectors are next. This is why the female unemployment rate is 4 points lower than the male unemployment rate. Women dominate the public sector, while men dominate the private sector. Guess which sector generates more productivity? What is going on in ND? K, big oil and natural gas boom. Do Dr. Mandel’s Great Depression government job figures include the WPA jobs? As I recall, WPA workers weren’t counted as employed since the WPA was regarded as relief for the jobless. For example, you may be pushing your spine into the ground, causing pressure on its posterior. works well for relaxing pinched nerves and relieving pain. A few well known symptoms of ulcers are back pain, headache, itching and choking sensation.